When you’re decorating your child’s bedroom, it’s easy to get carried away. Stuffed animals, knickknacks, and toys seem to multiply overnight until your kid’s room is an untidy, cluttered mess. If this sounds like your problem, it might be time to become a minimalist. Minimalism is all about choosing the things you love over everything else and living with less. Sound impossible? Not exactly. Here are some tried and true tricks to help you declutter your kid’s bedroom and keep the style. If you want to create a point of interest in your kid’s bedroom, don’t automatically reach for accessories. Brightly colored bedding, furniture, and wall art can do the job without adding to the number of things in the room. Choose an interesting color combination to really spice things up and your room will be instantly full of character. 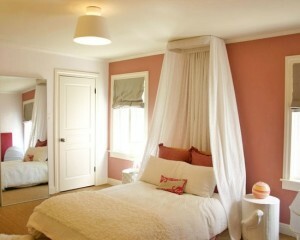 A focal point in any room catches the eye and pulls an entire room together. Just because you’re decorating a kid’s bedroom doesn’t mean that it shouldn’t have a focal point. A large, bold modern art print on the wall or brightly colored crib will do the job, but we particularly love this canopy bed. It practically screams style without seeming too grown up. Save money and maintain your minimalist credentials by decorating with handmade paper chains, bunting, and recycled maps or posters. Children are brilliant about not caring how much something costs, so take the time to create their room decor with them and they will love it more than the most expensive decorations that Target has to offer. 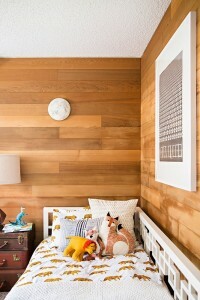 For those of us working with small spaces, a great way to add playspace to a room is to use the walls. 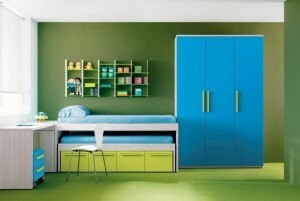 Removable wall decals, stickers, or artistic landscapes can turn a kid’s bedroom from ordinary into extraordinary. We love this superhero cityscape; it goes perfectly with the toy dinosaurs and makes the room feel playful and fun. Less is more, according to minimalists everywhere. At Modernize, we would also argue that the same goes for colors, too. 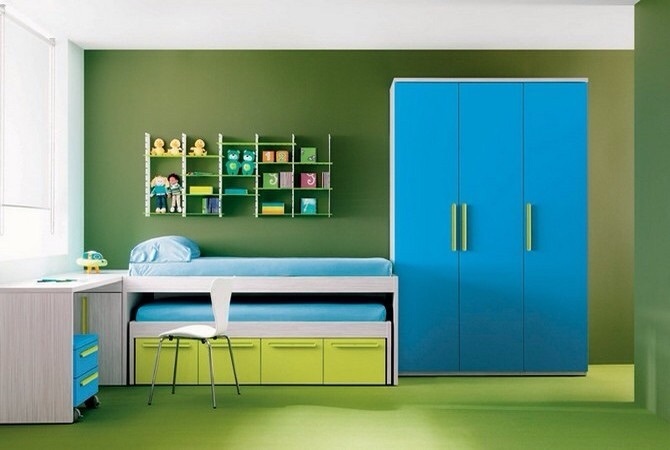 Choose a monochromatic color palette for your child’s minimalist room for a stunning effect. The best part about this kind of design? Black and white will never go out of style. Many people think that because you’re working with less stuff, a minimalist room is going to lack character. 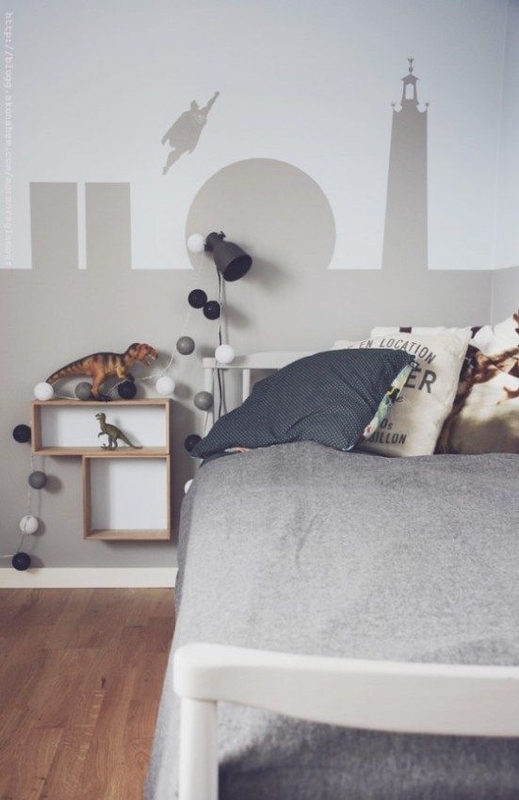 Get creative with furniture, prints, and even wall materials to take your kids’ bedroom to the next level. We especially love the use of vintage suitcases and wooden panels in this room, which create a homey, cozy atmosphere. For those of us who want to embrace minimalism but just have too much stuff, storage is the answer. 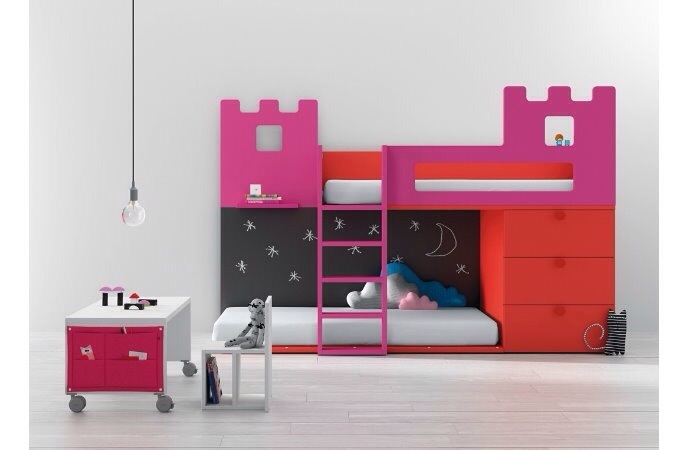 Luckily, children’s furniture companies are one step ahead of us with regards to storage, because most furniture combinations out there already come with built in underbed drawers and tons of other options. Just make sure you encourage your kids to tidy up regularly and you’ll be all set! Your kids would argue that their toys are their most prized possessions. By decorating their room with their toys, you are proving their point and saving yourself money on accessories at the same time. 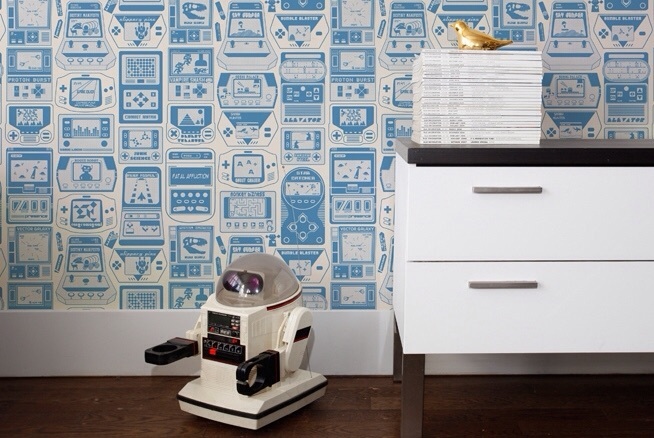 Pick the coolest and most retro toys to style your kids’ room, but remember that they are toys and will probably be moved and/or destroyed before too long.